HanseGroup, the German builder of the Hanse and Dehler brands, has introduced the Crossover and Free Ride sail. The Crossover sail is marketed for the Hanse brand and Free Ride for Dehler yachts. The sail features an asymmetrical cut and consists of lightweight CZ laminate. Easy to handle, the sail is delivered with its own forestay and integrated furling system which can be installed and rolled out in no time.It is being fixed to the anchor fitting and the gennaker halyard and sailed via any winch in the cockpit. In addition, the boatbuilder says the both the Crossover and Free Ride sail can remain attached as a second forestay.This creates a unique opportunity to enjoy downwind courses without having to set and take down the sail. 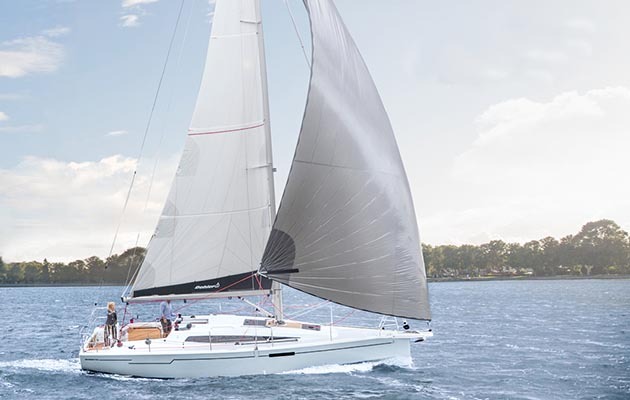 The highlight of the new sail, the boatbuilder says, is the large application range, which extends from 65 to 135 degrees to the wind.The new sail is stowed in a specially designed sail bag on the foredeck. The size of the sail depends on the model and is about twice the size of the self-tacking jib.For example, on a Hanse 455, this means a 44sq m self-tacking jib with 92.6sq m Hanse Crossover sail.This sail size is particularly recommended for light winds and helps to accelerate the yacht. The new sail has been developed by Elvstrøm specifically for the German boatbuilder.